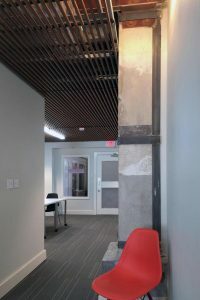 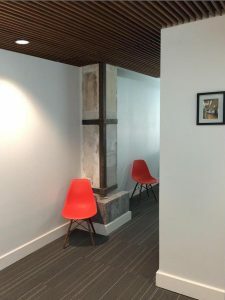 DESCRIPTION: The small design office for two full-time plus part-time employees is located on the ground floor of the historic Furman Building in the central business district of downtown Corpus Christi. 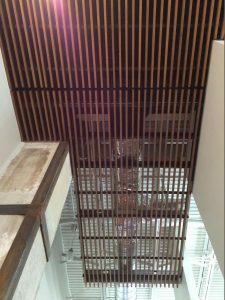 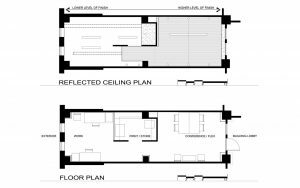 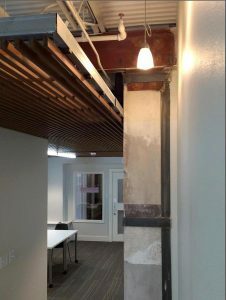 The design seeks to do a lot with little space and to showcase elements of building structural upgrades rendered in the 1980’s to extend the life of the landmark building originally constructed in 1913. 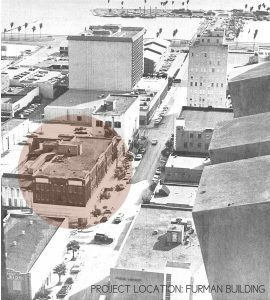 Design inspiration for the long, narrow space was taken from linear ship design, including the sailboats of the Corpus Christi Marina located two blocks away. 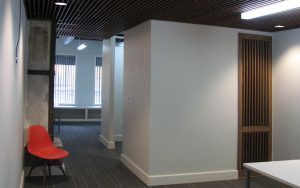 Design and sustainability strategies include: revitalization of an under-utilized downtown area, de-evolution of finish materials from public zone to work zone exposures, partial-height partitions for deep daylighting, zoned mechanical with dedicated outside air, high-efficiency lighting throughout, high recycled content carpet, FSC certified wood ceiling finish, low VOC paints and adhesives, and the use of salvaged building materials.